The Internet marketing landscape is on fire with talk about the client attraction marketing funnel. Like most things online, the latest tactics ebb and flow constantly. And sales funnel talk is the big thing mostly due to big launches by high power gurus. In reality, marketing funnels have been the rage in Internet marketing for years. But they aren’t discussed as much in the coach or consultant circles. Many coaches I talk to don’t understand what a marketing funnel is, and you might wonder whether it makes sense for your business. You might also wonder why I call it a marketing filter, not a funnel. Before discussing that though it’s important to note the “Make Money Online,” niche is where you’ll find the most cutting edge online tactics and strategies for Internet marketing. The advantage you have, as an offline coach or service provider, is most of your competitors aren’t watching those gurus closely. So if you can turn those tactics around to suit your industry, you move an instant leg up on the competition. Done right, client attraction marketing funnels are one of those tactics you can take to your industry and quickly double your revenues. And do it on complete autopilot. 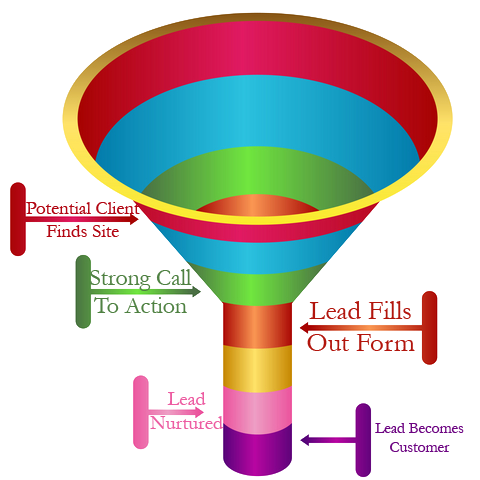 What is a Client Attraction Marketing Funnel and why does calling it a Filter Makes More Sense? Picture the funnel you use to put oil into your car. It is wide at the top and narrow at the bottom. This image illustrates how lots of leads and prospects bump into the top of your funnel while few trickle to the bottom. I don’t like the funnel metaphor, even though I often call it that because it’s the industry acceptable term. If you pour oil into a funnel, all the oil comes out the other end; it just takes a little longer. Besides, flow is based on gravity, not something you can control. What is a Client Attraction Marketing Filter? As a service provider, you likely do a lot of one on one selling. In other words, you sell in person (or on the phone) using a consultation, strategy session, or some other process. To be successful, you must speak to tons of leads. But to make it efficient, you want as many of those leads as possible to be your ideal prospect. A client attraction marketing filter is a system architected to ease bringing qualified prospects. It filters out the “poor fits” and attracts your ideal clients towards your consultation call. It’s constructed systematically to pull in ideal clients like a magnet and repel candidates you don’t want as customers. And no, you don’t want everyone as a client. Unlike a funnel, a filter controls what makes it through, and with the systems you implement in your business, you should have the same goal. How is this Different from Advertising, Networking and Other Client Attraction Methodologies? Networking to seek out new clients is wonderfully powerful. The problem is, it’s not scalable. The same is true for advertising (both online and off), speaking, and other client attraction methods when used on their own. It’s bet to think of these methodologies as traffic generation. However, pair any of these traffic methods up with an automatic client attraction marketing funnel, and you’ll see your efficiency soar to new heights. For example, how many times have you sat down with a prospect only to discover he doesn’t want, need, or respect your services? With your marketing filter, this time wasting aspect of your business is virtually eliminated. In contrast, how many times have you met someone who fits your perfect profile? Prospects who could use your services and get amazing value but you never manage to connect. Or you spend hours following up to get them interested enough to talk to you? Now instead, imagine having an automatic system that does this follow up for you. It pushes out “time wasters” and uses powerful attraction techniques to draw your ideal prospect closer until they’re begging for an appointment. And they’re pre-sold on what you can offer, making your job much easier. As Todd Brown says, “Good marketing makes sales superfluous”. In summary, a client attraction marketing funnel, or marketing filter, makes your job simpler. It’s set up once, tweaked to perfection, and runs on autopilot, attracting wonderful clients, and sending the rest on their way. It’s a repeatable, proven map that moves prospects down the buyer’s path, freeing up your time and increasing your income exponentially. If you’d like to learn more about how systemizing your business can double your income or more, and give you true business independence, download my free e-book by clicking here. It breaks down the 3 systems your business needs to give you the independence you got into business to find. Whether you call it a client attraction marketing funnel, marketing filter, or just marketing system, automating and systemizing your business has amazing effects on your bottom line. So get started today.